This is to remind me to make the family calendar for December and to look up the December holidays. 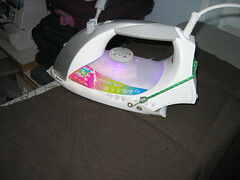 Step 1:Sew the fronts together. 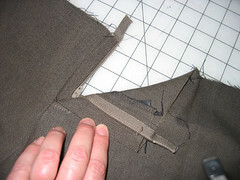 Usually, a pattern is marked where the pattern designer recommends that you stop the zipper or end the fly. Because I often take 2 to 3 inches (5-7.5 cm) out of the front crotch curve, I end up with a really short fly. I extend it down an inch. Where ever this point is, I’m calling it the bottom of the zipper. 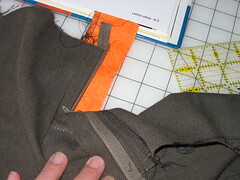 From the bottom of the zipper down, you want to sew with a regular stitch. 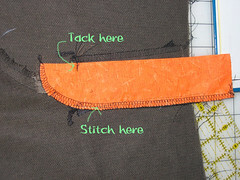 From the bottom of the zipper and up, you want to use a basting stitch. Sorry that I forgot to take pictures at that point. the side furthest from center front. on the side sticking out from the pants fronts. 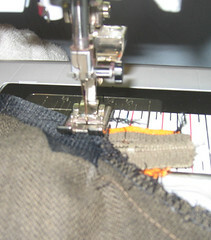 Use zipper foot to stitch close to the zipper. your right. They were on the left. Turn zipper over. Make sure that it’s flat. 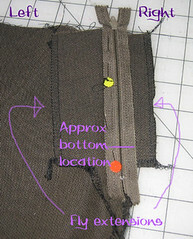 Pin zipper to the fly extension on your left. 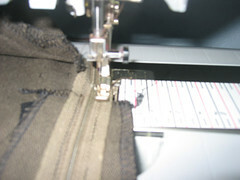 Using a zipper foot, sew close to the zipper. but no sewing shows on the front of the pants. they are right side up. nice and flat and smooth. 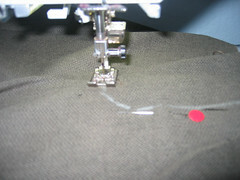 Using your usual foot, sew fly stitches in place. top, I tend to twist the fabric. Hey, it looks like a fly! Admire your fly some more. But wait; something is missing! 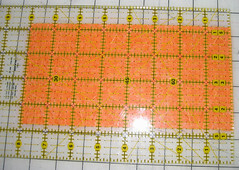 (10 x 20 cm) for the fly shield. Fold Fly Shield in half, wrong sides together. fly and the unpressed fly in step 21? some fabric from the bottom to form a curve. with a rectangular fly shield. 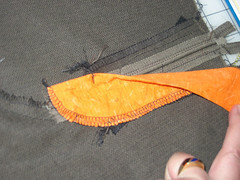 foot and a zigzag stitch. 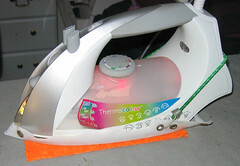 you only sew thru the fly shield and extension. time, but I didn’t sew close to the edge. Admire your fly from the wrong side. Admire your fly from the right side. Ta Da! No more steps. 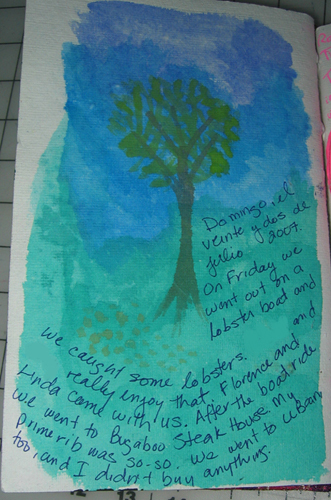 This page features a background in Biocolors washable paint, but it doesn’t run when I watercolor on it. 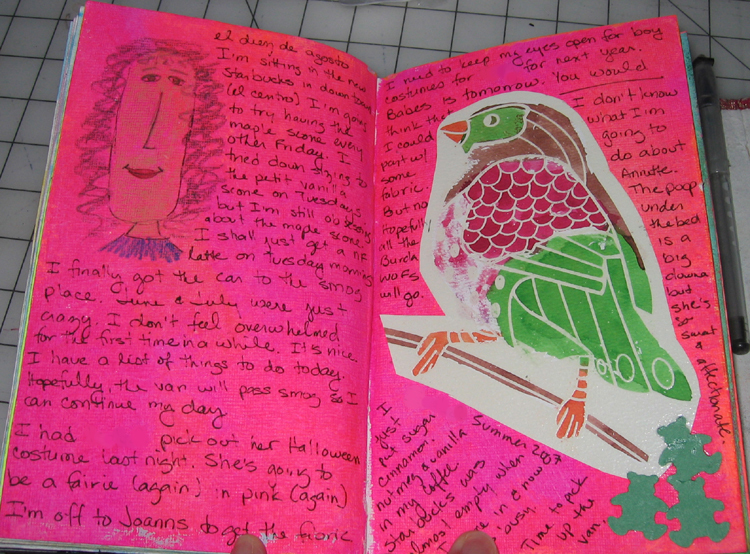 I used Biocolors because we have a lot of it. It’s a great paint for kids. The face doodle is in colored pencil. The bird is Chunguita’s artwork, and the teddies were stamped out by Pulguito. Here I was thinking that today was a day to celebrate sewing, but no. Then I thought it might be about your legs falling asleep, but no. It’s about commemorating the labor movement. 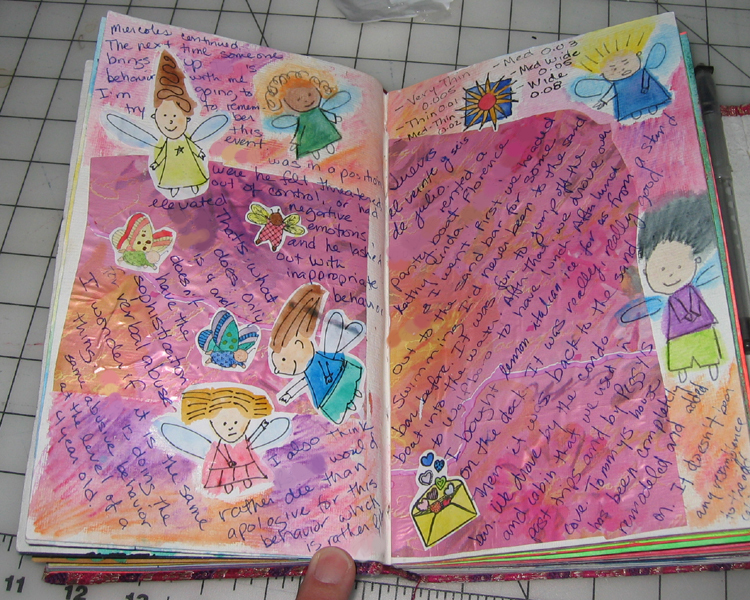 plastic paper, watercolor fairies, watercolored stamped images, and watercolor pencils.